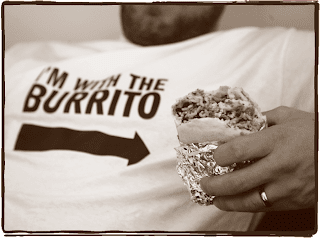 Qdoba is a small Mexican restaurant chain that has the best burritos - EVER! It's not a hop, skip and a jump from here, so I'm trying to duplicate these magnifico burritos at home. Combine all ingredients and marinate chicken for at least one hour or up to 4 hours. *I like to remove the tendon from the chicken tenders. Hold the end of the tendon and hold your knife parallel to your cutting surface and slide along the tendon to remove. Combine ingredients and cook rice as directed on package. Heat oil in a medium saucepan over medium heat. Add onion and garlic and cook until tender. Stir in remaining ingredients. Bring to a boil, reduce heat and simmer 10 minutes. Bush's Grillin Beans makes a fabulous Black Bean Fiesta that would go perfect with this burrito! Black beans simmered in a zesty chipotle sauce with crisp corn and red peppers. Save an extra step for preparing the burritos! Earlier in the day prepare marinade, add chicken and refrigerate until ready to grill. I used my George Foreman grill. Fit as many tenders as you can on grill. Cook on high for 5 minutes. Repeat with remaining tenders. Cover with foil to keep warm. Whatever juices accumulate in the drip tray, I add to the chicken to keep it moist. In the meantime, prepare black beans and rice. Steam flour burrito in your microwave covered with a damp paper towel for 45 seconds. Fill with rice, beans, chicken and cheese and condiments of your choice. I LOVE finding recipes that mimic fave restaurants... such a great idea! This sounds so good. Made this tonight! The chicken is awesome, although I had to tone down the spice for the kiddos. Thanks for the delicious recipe! My husband said it was better than Qdoba. Really delicious. Made this tonight and my husband liked it better than Qdoba. I just had to use less chili powder to tone down the spice for the kids.